This is what I call a vegetarian Homemade Mincemeat recipe as it does not contain beef suet. It is made with a variety of fresh, dried, and candied fruits that are all stewed in a delicious mixture of butter, apple juice, dark brown sugar, rum, brandy, orange zest and ground spices. So easy to make and once you taste this rich, sweet, and spicy preserve you will never buy it again. In the beginning Mincemeat was made with meat (hence the name), along with eggs, dried fruits and spices. Over time, beef suet (kidney fat) came to replace the meat and the eggs were dropped completely from the recipe. 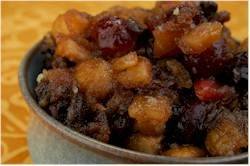 Today's mincemeat is thought of as a spicy preserve consisting of a mixture of dried and candied fruits, apples, and spices (with or without beef suet) that are heavily laced with brandy and/or rum. Now, the recipe given here does not contain beef suet, which the health conscious will appreciate. Instead we just add a little butter. Mincemeat is often made by just mixing all the ingredients together and then letting it macerate in jars for several weeks. However, this recipe is a little different in that it is first stewed which allows all the fruits to absorb the liquid and become wonderfully soft and plump. Once cooled, the mincemeat is covered and refrigerated. What is so great about this recipe is that the mincemeat can be used the very next day which is perfect for the last minute baker. You will find, though, that this mincemeat only gets better with age and it can be refrigerated for up to a month. Homemade Mincemeat: Place all the ingredients in a large Dutch oven, and bring to a boil over medium high heat, stirring often. Then, reduce the heat to medium-low and simmer the mincemeat, stirring often, for about 30 minutes, or until the liquid is almost evaporated. Remove from heat and, if desired, stir in 2-4 tablespoons of rum or brandy. Let the mincemeat cool completely, then transfer to a covered container, and place in the refrigerator, at least overnight, before using. It can be stored in the refrigerator for up to a month. Note: If storing longer than a week, stir in a little rum or brandy every week to keep it from drying out and to preserve the mincemeat. Otherwise it may not keep a month. Makes about 4 cups (1 Liter) of Mincemeat.